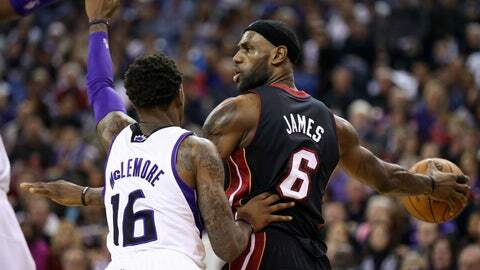 Miami Heat forward LeBron James (6) holds off Sacramento Kings shooting guard Ben McLemore (16) during the first quarter Friday night. SACRAMENTO, Calif. (AP) — DeMarcus Cousins had 27 points and 17 rebounds, Rudy Gay scored 26 and the Sacramento Kings rallied from an early 17-point deficit to beat the undermanned Miami Heat 108-103 in overtime Friday night. Isaiah Thomas added 22 points, 11 assists and seven rebounds to help the Kings snap Miami’s six-game winning streak. Gay made a tying jumper in the final minutes of regulation, and Sacramento quickly pulled away in the extra period to bring the sellout crowd of 17,317 roaring to its feet. LeBron James finished with 33 points, eight rebounds and eight assists, and Chris Bosh had 18 points and seven rebounds for the two-time defending NBA champions. Miami played without Dwyane Wade (rest), Ray Allen (right knee tendinitis) and Chris Andersen (sore back). Heat coach Erik Spoelstra said he wasn’t sure if they would play at Portland on Saturday night. The Kings overcame 23 turnovers and some lackluster defense late before pulling off the comeback. Sacramento outshot Miami 49.4 percent to 44.2 percent and outrebounded the Heat 51-35. A day after winning The Associated Press’ 2013 Male Athlete of the Year, James helped the Heat build a big lead early but couldn’t hold off a late Kings rally by himself. James set up Bosh for a dunk, then made one of two free throws to put the Heat ahead 89-85 with 2:42 remaining in the fourth. A few plays later, Mario Chalmers was called for a flagrant foul after pushing Cousins to the ground. Cousins made both free throws, and Gay hit a tying turnaround jumper. After Gay forced a turnover by James, Thomas missed a running shot. James came down with the rebound, dribbled down court and missed a difficult 3-pointer over Gay at the regulation buzzer. Gay made a 3 and Thomas hit a pull-up shot at the start of overtime. After James made a driving layup, Thomas answered with another from beyond the arc to give the Kings a 97-91 lead. James still nearly rallied Miami from eight points down in the finale minute. He hit three consecutive 3-pointers — sandwiched between Sacramento scores — to bring the Heat within three with 13.1 seconds left. But James and the Heat ran out of time. At the outset, James wasted no time putting Miami in control. He scored nine points and assisted on two of Shane Battier’s three 3-pointers during a 23-6 run to open the game. With James on the bench, Sacramento sliced Miami’s lead to seven in the second quarter. The four-time NBA MVP returned and restored order — at least for a moment — to help the Heat go ahead 55-45 at halftime. The Kings outscored Miami 29-18 in the third quarter behind big plays from Cousins and Gay — with almost all of them directed by Thomas. Sacramento entered the fourth with a 74-73 lead to set up a furious finish. NOTES: James passed Larry Bird (21,791 points) for 30th place on the NBA’s career scoring list. … Spoelstra said Greg Oden’s rehabilitation from various knee injuries is progressing, but the center is not expected to play in Miami’s lone visit to Portland on Saturday night. … Cousins was called for his NBA-leading ninth technical foul after arguing with officials in the first quarter. … The Heat entered with a 7-0 record against Western Conference teams this season.